Are you tired of the same toner cartridges that cost a small fortune and tend to run out just as quickly as the last one? It seems like you just bought a new toner cartridge for your printer and now you need to head to your local office supply depot to purchase it yet again! This can be an issue when you use your printer on a constant basis, either for business or for pleasure or for schoolwork. Some toner cartridges can cost upwards of $40.00, especially when you get into not only color toners but also brand name toners. Some printers state that only a certain kind of toner cartridge can be used to ensure quality printing but this isn’t always the case when the printer can easily use different brands with the same results. If there is a warranty involved, then double check to make sure that using a different brand of ink will not void anything! There is a solution to this expensive problem, however, and that is a new product on the market which is available through 123Ink.ca! 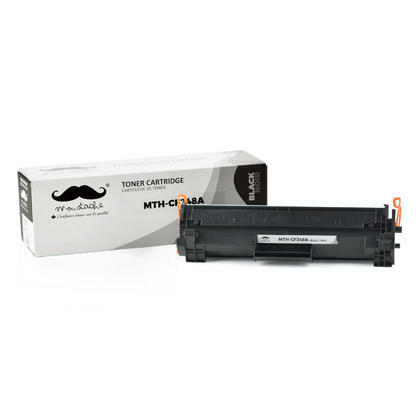 Please allow me to introduce the Compatible HP 48A CF248A Black Toner Cartridge. This toner cartridge is guaranteed to print at least 1000 pages without losing quality. The first page printed on a new cartridge will have the same saturation level as the 1000th page or it is your money back. This cartridge will let you know when it is time to change the unit once the color starts to fade from the saturated black of the first 1000 pages. With an overall cost of $34.99 plus applicable taxes and fees, this toner cartridge averages to cost a total of three and a half cents per page. You can’t bring a document to your local office supply store and print for that low of a cost! If you decide to purchase your toner cartridges in bulk, you have a guaranteed two years to use each product before the ink loses its consistency and becomes useless. When you use a printer on a consistent basis, these two years can take forever to come to pass. Each cartridge is made using only new products that have passed vigorous environmental testing and each one is guaranteed to meet all green standards. Each cartridge is covered under a two-year warranty if the cartridge does not meet your expectations or lasts for less than the guaranteed 1000 pages. You are also protected by the full refund and free return policy offered by 123Ink.ca! There is no reason to waste money on expensive ink cartridges that only last as long as the cheap versions, especially when it in terms of a product like the Compatible HP 48A CF248A Black Toner Cartridge. This cartridge, as discussed, features all of the same benefits as other cartridges for a fraction of the cost! With a flat cost of $34.99 plus any applicable shipping fees, you have to option to purchase a single cartridge, a double pack, a four-pack or a 10 pack of cartridges! The most that this will cost you is $314.99 but then you have 10 cartridges that not only last for 1 year but are guaranteed to print at least 1000 pages per cartridge. So why spend your money on expensive cartridges while wasting valuable time to go and purchase them when you can easily order online with a few mouse clicks and have them shipped right to your door!